Single, brilliant, fiery red blooms centered with bright yellow stamens make this a beautiful addition to the winter garden. Blossoms stand out in high contrast against glossy, dark green foliage. 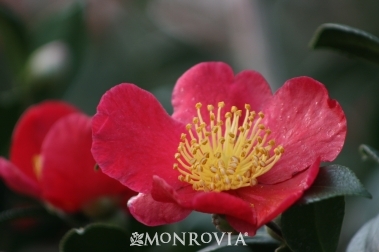 Excellent choice for a colorful hedge or screen, espalier, and border shrub. Mid season bloomer. Evergreen.